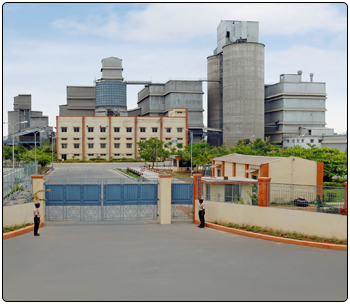 This grinding unit with a capacity of 0.5 MTPA is located in Kanchipuram District and was commissioned in May 2009. The Plant is in close proximity to the Tamil Nadu customers, especially Chennai, which is well connected by road through NH-45 and by rail through main Chennai-to-Trichy broad gauge line. Closed Circuit mill along with latest high efficiency separators ensures proper particle size distribution of cement. The mill is partitioned with level controlled diaphragm with large centre opening. The diaphragm allows the desired particle size to pass to second chamber resulting better grinding efficiency. Particles which are too coarse to pass the screen are returned back to first chamber for further grinding. Cement is stored in two cement silos, extracted, bagged by two electronic rotary packers of capacity 180 TPH each consisting of 12 spouts with an accuracy of +50 gm and -0 gm, and shipped by trucks.